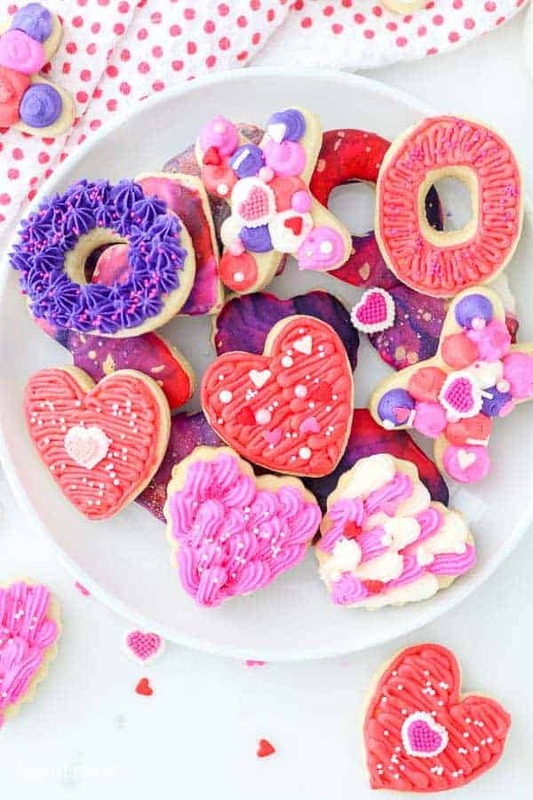 These adorable Valentine’s Day Sugar Cookies are decorated with vanilla buttercream and also vanilla icing. 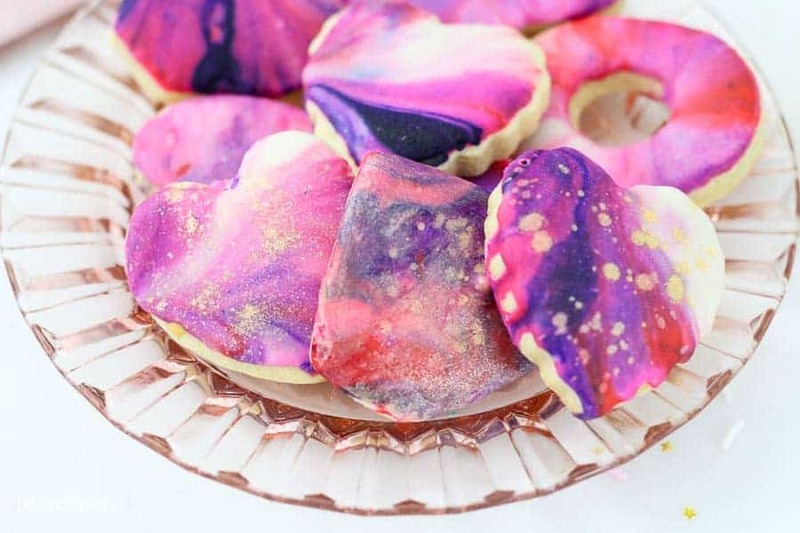 The vanilla icing is a swirled marble sugar cookie also known as a galaxy theme. These sugar cookies are a classic roll out cookie, it’s soft baked and not overly sweet cookie. 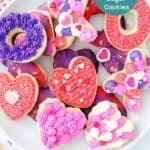 I love making homemade treats for Valentine’s day, and even though I am partial to chocolate covered strawberries, there’s still plenty of room for Valentine’s day sugar cookies. For these Valentine’s Day Sugar Cookies, I found the cutest mini cookie cutters in the Target dollar section. 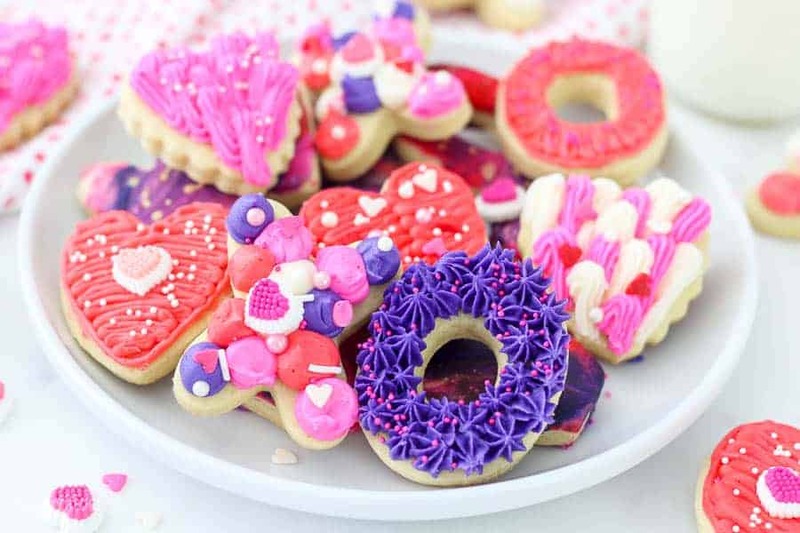 I pretty much love any mini desserts, but these cookies are just TOO cute, I had to share. I spent this past weekend playing around with different way to decorate my favorite sugar cookie recipe. It’s a soft baked, not overly sweet, rolled sugar cookie recipe. I’m not the best cookie decorator, but I try! 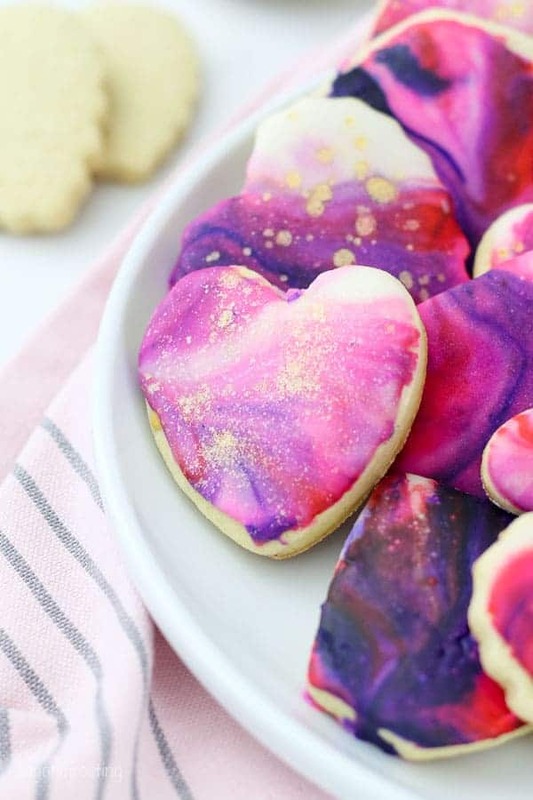 This time around I made two types of sugar cookies, one decorated with my perfect vanilla frosting and another decorated with marble icing, also known as galaxy icing. 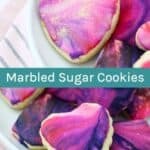 If you’re not much for cookie decorating, you need to try the marble icing, it’s SUPER easy and I share all the details about how make marble icing for sugar cookies below. 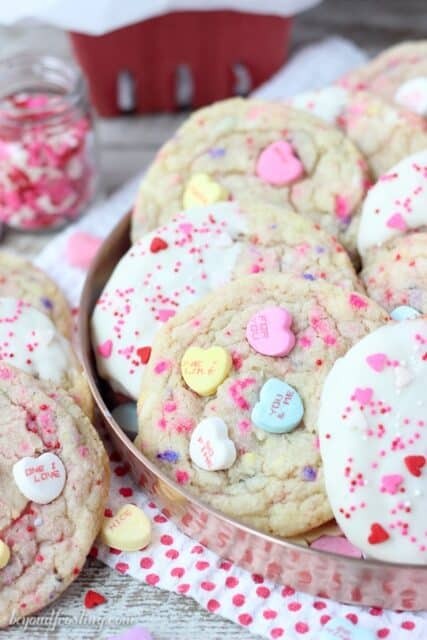 But first, let’s talk about the valentine’s sugar cookies with buttercream frosting. First, the cookie recipe. Thankfully, I’ve already covered topics such as, how to make sugar cookies. In that post I share detailed instructions for the recipe. It’s a really basic recipe, the dough just needs a little time in the refrigerator before you roll it out. And if that’s not enough, there’s also all my tips and tricks for sugar cookies. The thicker the better ya’ll. 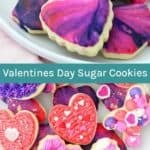 That post is packed with information, so it you’re looking to step up your sugar cookie game, give it a read through. 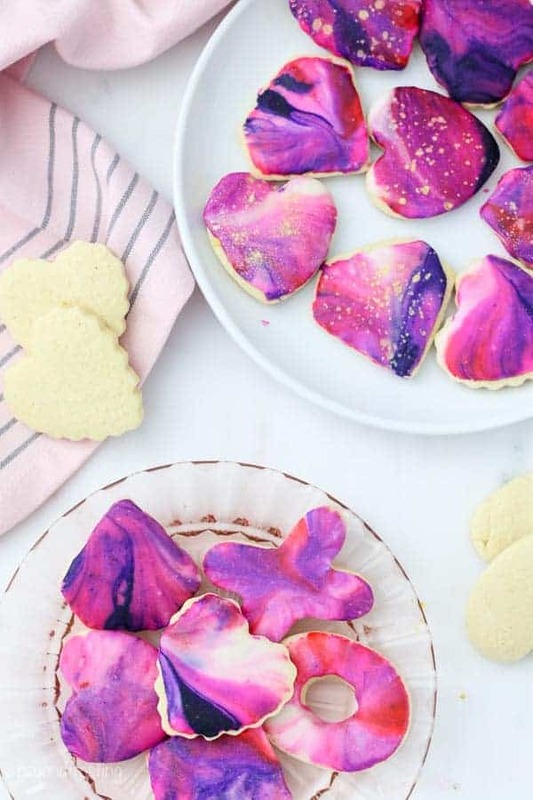 If decorating with sugar cookies with buttercream frosting is your jam, I covered that too. Personally, my favorite sugar cookies are covered with a thick layer of vanilla buttercream. Especially if there’s a glass of wine involved. My secret to making buttercream frosting is starting with cold butter. It allows you to control the stability of your frosting. I whip the butter for several minutes at various stages in the process which makes a very light and airy frosting that is easy for decorating. I have a lot of things to say about how to make buttercream, because I want everyone to be successful with it. I only used 3 different piping tips for the buttercream cookies, size 18 open star tip, size 12 round tip and size #3 or #5 open round tip. 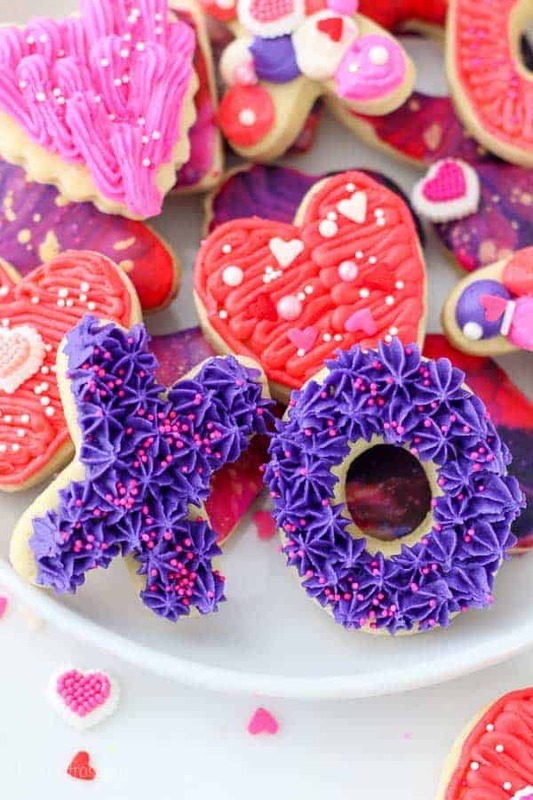 Using these tips with a variety of color, you can create these easy designs on your cookies. When picking your color palette, 2-3 colors plus white is my favorite. If you have a set of couplers, you can easily change your tips between colors. Don’t forget to have some of your favorite sprinkle on hand to add the final touch. 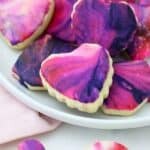 Whether you decide to decorate these Valentines Day Sugar Cookies with vanilla buttercream or with marble icing, I know you will LOVE the final results. 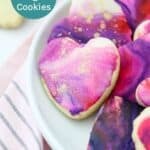 As soon as I dipped my first cookies into the swirled icing, I fell in love with this EASY sugar cookie decorating technique. 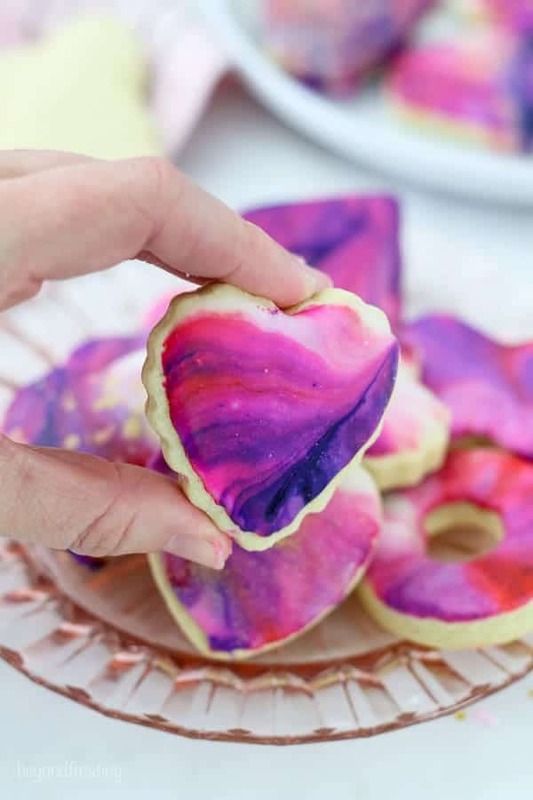 These marble sugar cookies are not just for Valentine’s Day either. This is a great technique that you can use for themed birthday parties, baby showers and just about any holidays. And let’s face it, it’s waaaaay faster than decorating with buttercream. Even my sister in law on in on the action! The vanilla icing is a very simple recipe, it similar to a glaze you’d use for a bundt cake. I did some Goggling before I started, I saw a combination of recipes including ones that use meringue powder or corn syrup and some recipe that used neither. I chose to use corn syrup thinking I’d get a little shine or glassy appearance on the icing and it also help to thicken the icing. It wasn’t quite as shiny as I’d like but it’s still so pretty! Simply combine the powdered sugar with the milk and whisk until it’s well combined. If you think it’s too thick, slowly add additional milk. You want it to be drippy but not runny. Then whisk in the corn syrup. If you think you frosting is too runny, add more powdered sugar, ¼ cup at a time. When it’s time to add color, you’ll want to be sure and use Gel colors such as Wilton or Amerigel. These are thicker and more concentrated than traditional food coloring. Amerigel offers lots of individual colors, so you can get super specific whereas Wilton’s Color Right Color System is 8 basic colors that you can mix together to create over 50 different shades. You can purchase them at craft stores, cake supply stores or online. The icinig does dry completely, meaning you’ll be able to stack these cookies once they are fully dry. It can take anywhere from a couple hours to overnight depending on how thick your icing is. You should know that the color of the frosting will be less saturated as it dries. It really is the prettiest when you first lift it out of the icing or even after it has slightly dried. I also noticed I had some white areas that appeared to be powdered sugar. Therefore, I recommend sifting the powdered sugar. I did not and in hindsight I wish I had. When I was baking these cookies, I did so with the intention of the marble sugar cookie icing, so I made them extra thick. I think it helps when dipping them in the icing. Plus the icing is on the thinner side, so it helped to have a nice thick cookie underneath. Wear some latex gloves if you have there. These can be a little messy and the gel colors will easily stain (fingers, clothes, counter tops) unless you wash it off right away. It’s best to place your bowl over some parchment paper or paper towels to catch the extra drip. Be prepared with your cookie sheet covered in parchment paper or a silicone baking mat to place your finished cookie on to dry. 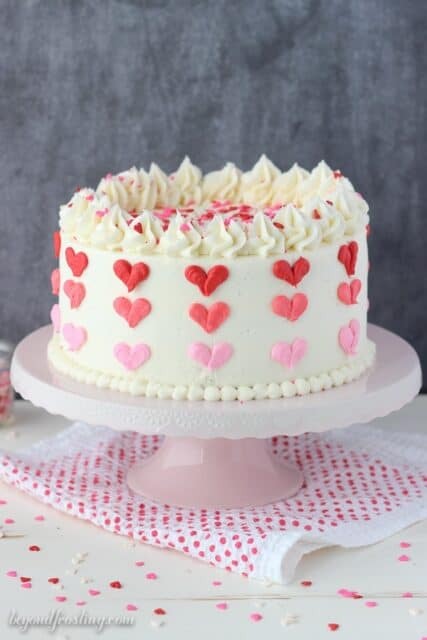 Sift the powder sugar in order to avoid lumps in your icing as it dries. Save some of the white icing to the side, allowing you the ability to add some white back in to your swirl. The best-looking cookie have some white in the icing. After you dip and dip and dip, your icing will start to lose some white on the surface. Use only very small amounts of the gel color and gently swirl with a toothpick. Using a tall rimmed plate may give you more surface area to work with. 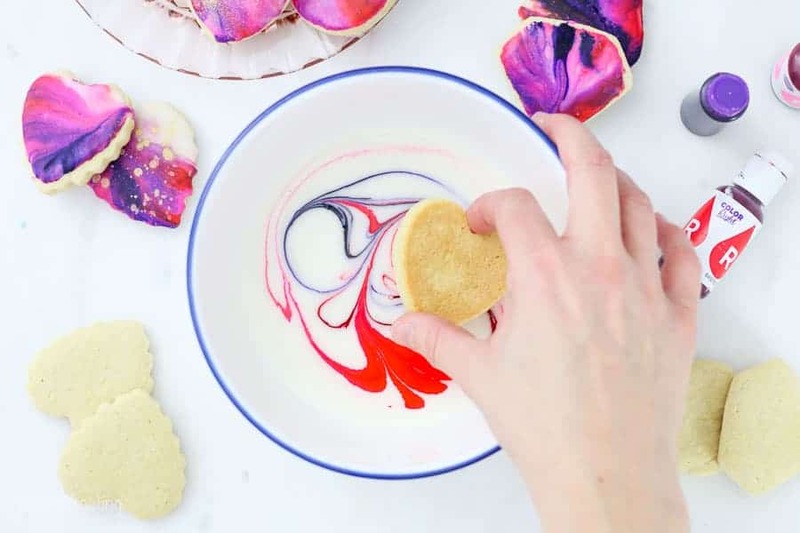 When dipping your cookies, allow some of the icing to drip back into your bowl before you flip it over, otherwise it just runs all over the sides of the cookie. Remember this the frosting for your sugar cookies, so using a vanilla extract is fine but you might also prefer a flavored extract. OR you can flavor your sugar cookies instead. I tried a couple different ways of doing this. I tried the paint brush splatter, I tried sprinkling the dry simmer and I tried painting the simmer on the dry frosting. The method I like most is sprinkling the dry simmer on frosting. I think it looks the best. If you prefer the look of the paint splatter, then I recommend waiting on the frosting has settled a bit, a little less wet on top but not fully dry. Wet on wet will cause the splatters to spread. In order to do the splatter method, mix the simmer with clear vodka or a clear extract such as almond, vanilla or lemon. Combine them in a small bowl and then tap the wet paintbrush over the cookies. The last option is to paint the pearl dust after the cookies have dried. Mix the pearl dust with a clear extract as discussed above and paint it over the dried icing. I didn’t love this effect because I feel like it really altered the marbled icing. 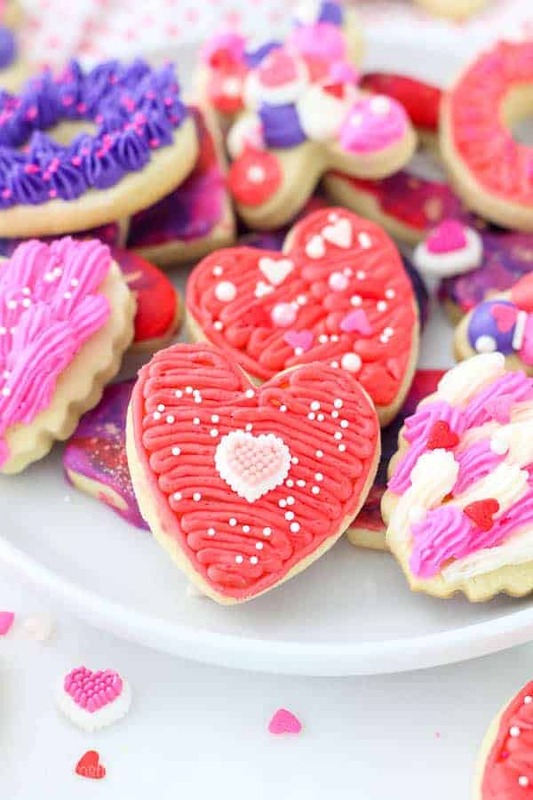 If you’re looking to make these Valentine’s Day Sugar Cookies, be sure to prepare them at least 24 hours in advance. You can break the process up by preparing and freezing your cookie dough or freezing your baked cookies. It’s definitely possible to bake and decorate in the same evening, just give yourself a few hours! Happy Valentine’s day friends! 1 1/2 cups (3 sticks) unsalted butter, cold. For the cookies: Beat the butter and sugar on medium high speed until the sugar is dissolved and creamy. For the buttercream: Cut the butter into pieces. Using the paddle attachment, whip butter for 5-7 minutes, scraping down the bowl occasionally. Beat until butter look light in color. Add 2 cups of powdered sugar and mix on low speed until incorporated into butter then add 2 tsp of vanilla extract and mix to combine. Beat for about 60 seconds. Next, add an additional 2 cups of powdered sugar and beat on low speed until sugar is incorporated. Increase speed to medium-high and beat for 3 minutes. Add last 1 cup powdered sugar along with 2 tbsp heavy whipping cream and 1/2 tsp vanilla extract . Beat on low until ingredients start to mix together. Increase speed to medium-high and beat for another 3-5 minutes to whip additional air into the frosting. Dye frosting with desired gel colors and divide into your piping bags. For the marble icing: Combine the sifted powdered sugar and milk in a bowl and whisk until well combined. If needed, add additional milk to thin out the frosting. If too thin, add an additional 1/4 cup powdered sugar. Then Whisk in the corn syrup. Set aside 1/4 cup of the white icing. 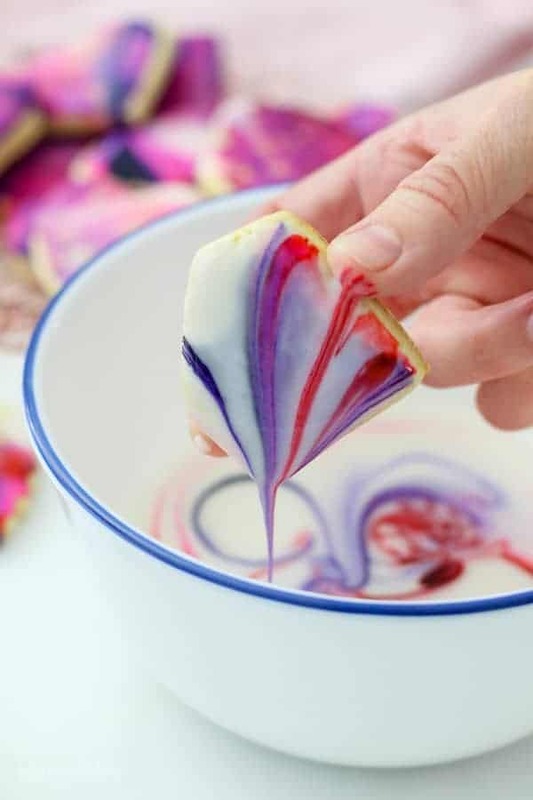 Add a small drop of your gel colors to the icing and gently swirl with a toothpick. Gently dip each cookie into the icing and then tilt the cookie to the side to allow excess icing the drip off. Place on a silicone baking mat or parchment paper and allow to dry completely. I happened to find this right when you posted it yesterday. 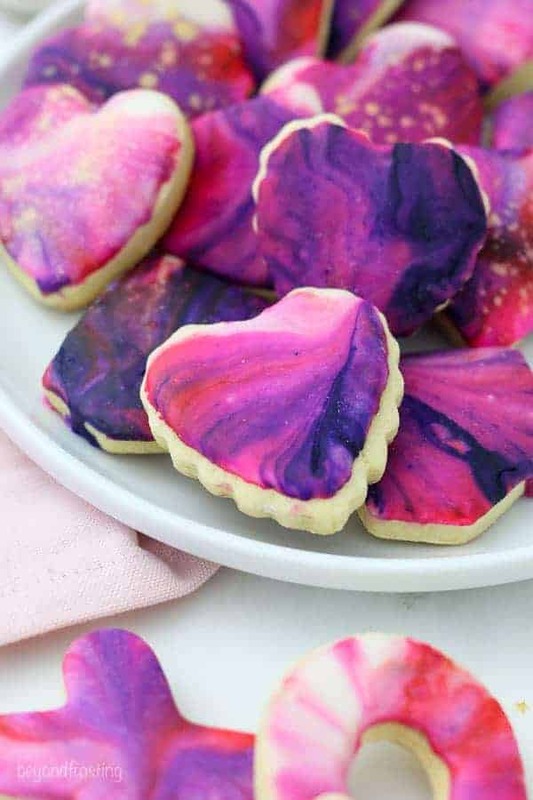 I was looking for a cool decorating idea for cookies for my birthday (tomorrow). I am so excited to try it! I bought a few other decorating supplies to add in just to try them, like star-shaped sprinkles, sparkly sugar, and metallic spray color – we’ll see how it goes. I’ll take pictures to share! Omg that’s awesome!! Definitely report back- I’d love to see photos! 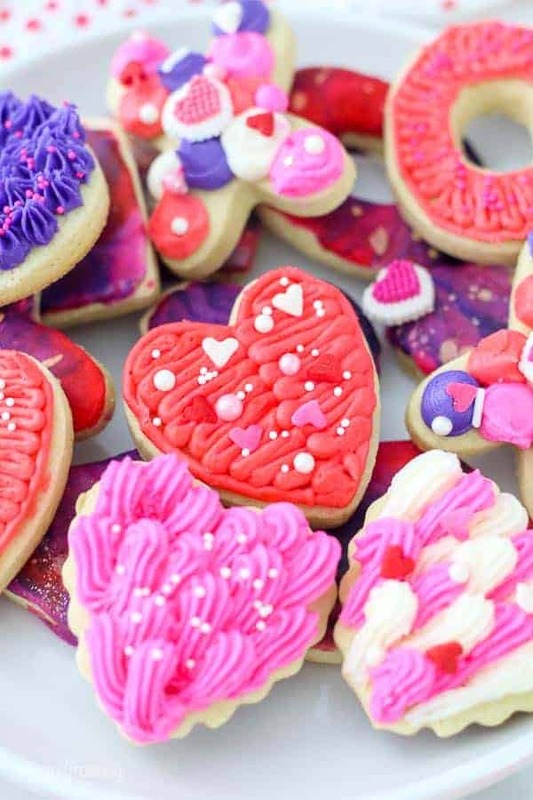 Will make & ice the cookies for granddaughters for our Valentine box craft day this weekend – looking forward to trying them, thank you. Find all the pop-up ads sooooo annoying – cover parts of the recipes – yuck. Must repeatedly X to close ads – annoying! Sometimes just leave your site without exploring all you have to offer – sad. Hi Sharon. I am sorry you’re experiencing this. It would be helpful to know what type of device you’re on? Other than 1 pop up for my email list, there shouldn’t be any other pop up ads, maybe one that is sticky along the bottom of the screen but that’s about it.